Wrapped up ponytail is a unique way of styling your hair into ponytail and it also involves simple styling process that can make the hairstyle look amazing. Just use this technique on your hair to get this look perfectly. Make sure to brush your hair completely to add volume into it before beginning your styling. Use a normal styling tool such as bobby pins, hairspray and hair elastic to achieve this hairstyle on your own. First take a bundle of hair in your hand for combing it in different ways over your head. The pull out the brushed hair and the bundled hair together and create the simple bump over the head. Wrap the hair with elastic and press it gently toward the scalp over your head. 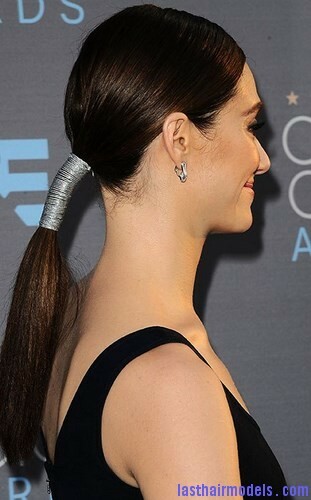 Now pull out about half inch hair part at the bottom of ponytail and try to wrap it over the elastic. 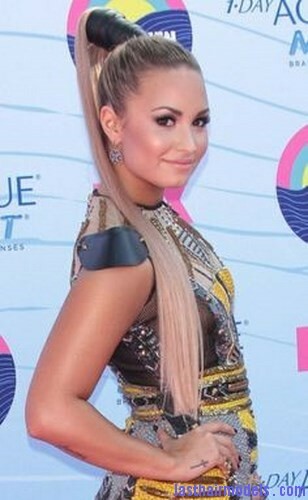 Then try to secure it using bobby pins by simply pressing it underside the ponytail. Now you will be able to find a hair section in a bobby pin which must be turned downwards by sliding it down over your scalp making the base of the ponytail that will be secured in place. Now slide your hair and try to cover hair elastic before using the hairspray to mist the entire hair to complete the hairstyling process. You can also use hair elastic that matches your hair color to make the ponytail look good.